We followed the microwave directions on the box, then split each sandwich so we could try half of each variety. The cooking directions are accurate; cooked for the recommended 1 minute and 15 seconds, the sandwiches were hot and not over cooked or chewy. When microwaved, the croissant isn't flaky, it just tastes like an average "bun". The egg and cheese flavors are pretty indistinguishable - all you taste is the sausage. And the texture of the sausage is very fatty. One of us even came across a few pieces of gristle. Taste Tester Matt L. (my roommate) said, "You're supposed to be full after that? It a two bite sandwich!" To which I (Kellie D.) replied, "You better be full. You just ate 23 grams of fat -- 35% of your days allowance -- including 7 grams of saturated fat, and 3 grams of TRANS fat!" I didn't even mention the 145mg of cholesterol - that's 48% of your daily allowance. All in all, we were not very big fans of the croissant. Of the two varieties, we were more impressed with the biscuit sandwich. "I thought I'd like the croissant more, but the biscuit is definitely better," I told Matt. Matt looked at me with part of the biscuit sandwich still in his mouth, "It tastes like a biscuit... has seemingly more egg. The biscuit is more substantial - there's no way I could eat this in two bites." We had to agree that the biscuit sandwhich was pretty tasty. But we also agreed that the portion wasn't very large. Breakfast sandwhiches from McDonald's and Burger King are quite a bit bigger. If you're really in the mood for a sausage and egg biscuit, and can't get to McDonald's, this is a pretty sub-par substitution. Nutritionally, you'd be better off going to Krispy Kreme. Neither of us plan to buy these sandwiches again. If we want to feel guilty about having a bad breakfast, we'd rather go to McDonald's and get the hash brown, too! $2.50 reflects the sale price of two boxes for $5.00. Each box contains two sandwiches. 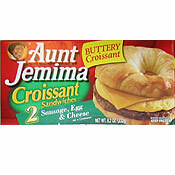 What do you think of Aunt Jemima Breakfast Sandwiches? I can't find the Biscuit sandwiches any longer in Davenport, Iowa. Are they still making them? I followed the directions and the bottom croissant was over-cooked rock solid, while the egg/sausage was still frozen. It also does not taste that great! Not worth $2.50/sandwich! Awesome stuff aunt I'm having it right now the croissant one make more!!! WARNING: Each Aunt Jemima Biscuit Sandwich (Sausage, Egg, and Cheese) has 3g of trans fat. That's a lot. Doesn't taste that great either. Mine did not have cheese! How ridiculous. Never again.. I don't follow the instructions when fixing the sandwich because the sandwhich doesn't end up right. But once I figure out a way to have everything just the way I wanted it, the croissant was good. I don't eat much, so for me the serving size was great!! Unforunately, there are alot of nutritional issues. I bought the croissant sandwich, and when I bite into it, there was a huge black hair right in the middle of the sausage patty, it was disgusting. Also, half the cheese was missing. I tell my husband, when I eat these and similar items like this, I get a "chemical" feeling in my body. These have a lot of junk in them and they are not good for you. 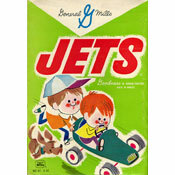 They are tasty though, as long as you can get past the freezer burn that accompanies pre-made food. I bought the two croissant sausage egg and cheese sandwiches,which i thought were delicious! I have been purchasing the croissant breakfast sandwich for quite some time now. i love them. they are the closest thing to burger kings croissant that you can get. the only problem: the last box i purchased one sandwich was fine but the other one had no cheese on it at all. i was very disappointed because i took this sandwich to work to be my lunch and when i bit into it there was no cheese. first time ever having a bad experience with the breakfast croissant sandwich. Bought Aunt Jemima Sausage, Egg and Cheese 4 pack sandwiches. Was not very impressed at all and 2 of the 4 sandwiches had NO CHEESE. Wont be buying them again. I got a 2 pack of sausage egg and cheese croissant and one of them didn't have the sausage. I was very disappointed . They are usually very good. I thought it was pretty good for a quick breakfast snack. Not everyone has time to go the McDonalds before work. This is perfect to grab and go. I tried the croissant sausage and egg and 2 were enough for my breakfast with some cereal. I don't understand the size problem, McD's and the new Tim Horton's sandwich are about the same size here in Canada, where the price of one = the price of 2 Aunt J's. I did mine in the oven for the time suggested and I found they weren't as greasy as McD's or Tim's. I have a sensitive gut and 2 Aunt J's sandwiches didn't adversely affect me at all. However, the only breakfast sandwich that still rules is Subways sausage and egg.